Calvin & Aaron in Vancouver, Canada! Good news for those that are Fahrenheit fans of Calvin & Aaron. Just found out for those lucky N. American fans if in Vancouver. A local competition in Vancouver marks a 10 year anniversary called Sunshine Boyz. Yes this was the one that started Calvin's career. Fairchild Radio is looking for 5 boyz and 5 girlz of Asian heritage between the ages of 16-25 to be contestants in this year’s Sunshine Nation contest. For the last nine years we have been seeking out outstanding talent and offering fascinating opportunities to young people in the local community. We started with the Sunshine Girlz competition in 1999, which gave young women the chance to sing, dance and perform their way into the attention of leading talent scouts. We then decided to give their male counterparts a chance, and transformed the contest into the Sunshine Boyz in 2002, giving young men the same opportunity to pursue their dreams of stardom. Finally in 2006, we took on a whole new vision, uniting our Boyz and Girlz together in one Sunshine Nation. Some of our Sunshine alumni have taken on exciting careers in the entertainment business in Taiwan, Hong Kong and China. Most notably, our 2004 Sunshine Boyz Champion, Calvin Chen who is now one of the members of the hottest boy group in Taiwan, Fahrenheit. 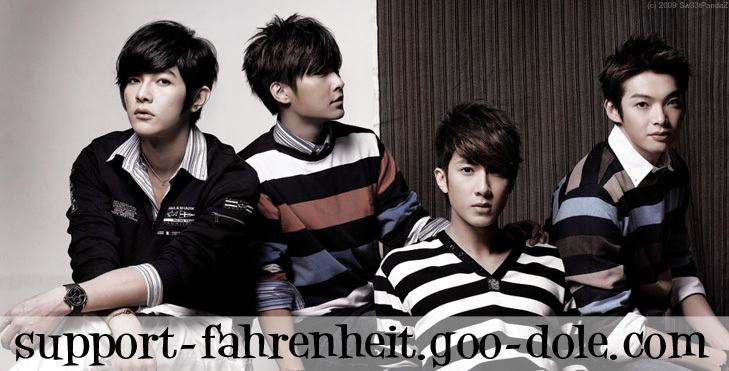 Few would argue that Fahrenheit is the biggest boy band sensation in Asia since the legendary F4. Each of the four members of Fahrenheit – Calvin Chen, Aaron Yan, Jiro Wang and Jun Wu – has unique talent and charisma in his own right. Yet together, they are the kings of teen idols, attracting fan mobs and swarms of reporters everywhere they go. This year we will welcome back Calvin Chen to the Sunshine family when he performs live with another member of Fahrenheit, Aaron Yan at the Sunshine Nation finale on August 29th at Michael J. Fox Theatre. This year, contestants in our Sunshine Nation contest will be eligible to win cash scholarships, deluxe tour packages to the Rockies, and have the opportunity to launch an acting career in Asia and star in a music video. The Boyz and Girlz Champions of Sunshine Nation will also be featured on the cover of the nationally distributed Popular Lifestyle and Entertainment Magazine. This contest is organized by Fairchild Radio in cooperation with Comic Productions/Meteor Garden Production, which produces popular dramas in Asia. I ♥ my hubby ! so back OFF!! Does anyone know where to buy the tickets from? Subject: Re: Calvin & Aaron in Vancouver, Canada!